We Will Not Be Shaken. Lessons from the Wilderness. As the soaking rains seeped through our thick hiking socks, our boots felt heavier the longer we splashed through the South Missouri mud. We had been in the wilderness two days at this point but the stabbing cold made it feel much longer as we continued towards an unknown destination. We followed behind leaders who silently guided us, topographic map and compass in hand. As we slipped through the brush, not able to avoid the briars, we knew we weren't just off the trail. We were lost. We had only gone a few feet off the trail, feet slipping in the mud, when we stopped as a team to discuss our best direction. Dark was quickly closing in and we weren't sure which ridge we were actually on. We needed to find somewhere to camp soon after hiking all day in the pouring rain. Packs that were already heavy grew in weight by the moment and none of us had dry clothes left. Empty stomachs were grumbling and our spirits were as drenched as the Ozark Trail we couldn't seem to find. We backtracked up to the last place we saw the trail, decided to follow it until we could better determine where we were. 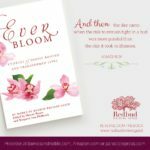 One teammate stooped down to pull our anxious eight-year-old daughter close as we prayed. 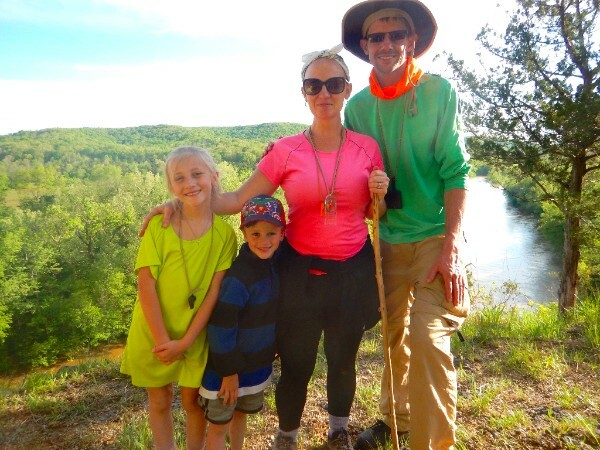 We asked God to stop the rain, to heal our littlest team members' aching backs and ankles, to continue to heal my husband, Lee, who had been unable to keep any food down in two days, to show us where to camp. We cried out—lost, wet, desperate. We followed the trail until we saw a clearing, hopeful that it was the valley we were looking for but unsure we were willing to let down our guard yet and hope. As I tried to hold it together for the kids, my son's cries growing louder, another sound broke through my prayers for relief. "I will not be shaken. I will not be shaken." Her tiny ankles were quaking and the rain wasn't subsiding. There was no end in sight. But as we walked through that clearing, my daughter was speaking the Truth out loud, holding onto His promises to be with her. Barely a whisper, she was clinging to them like they were her very life. As we walked we were memorizing Psalm 62:5-8 and the words we had repeated throughout the day were sinking deep into her heart: "He alone is my rock and my salvation, my fortress; I will not be shaken." I wiped away my tears as I straightened my pack and kept walking. The two weakest and tiniest members of our group of twelve were teaching us what it meant to have the faith of a child, to cling to the truth and to trust that He will not let us down. As we rounded a corner in the forest trail, we heard the sounds of the river and the crunching of rocks under our feet. We turned our headlamps towards the sounds, sobs catching in our throats as we saw the fire ring on the beach. We were at our destination at last. This is a tiny glimpse into the lessons I am still meditating on that I learned in the wilderness this Spring. We intentionally placed ourselves in a place of total unknown as we entered a two-week cross-cultural training that would help prepare us for the international move we've been working towards for over a year now. 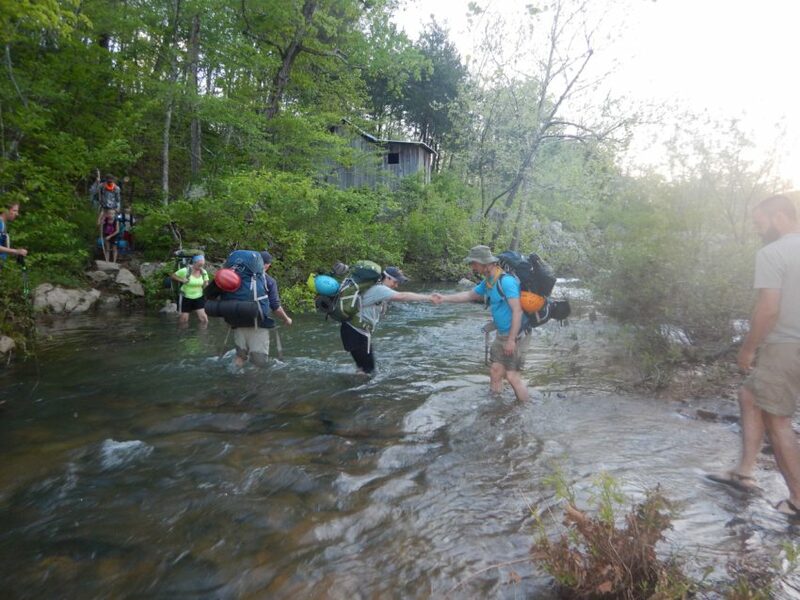 The first part of the training consisted of a multi-day (of undetermined length so that we were always wading through the unknown) period backpacking through the Ozarks with eight other people on similar journeys as us. We were also unintentionally placed in another wilderness when our plans to move to one location in South Asia fell through and we were completely in limbo, trusting God to show us just the next step. The kids were talking about what they learned following our five days of hiking over 20 miles up mountains and across swift flowing rivers, building our shelters, building a fire and cooking over it, and so many more physically and emotionally stretching moments. Our daughter who saw God answer every prayer for healing, for the rain to stop, for guidance, said it made her want to pray more. "God provides even in the wilderness," she said. She won't understand the full impact of the seed that was planted in her little life for many years. But the courage her words of complete trust in His goodness are growing deeper places of faith in my own soul. We are about out of the unknown. We have a new destination in South Asia and a goal to get there by fall. But we know there is still much wilderness ahead. We set out on the next leg of our trek knowing it is on solid ground that we step, declaring boldly, "we will not be shaken!" The Capacity to Rest. For SheLoves Magazine. The world outside the window fits the world inside me in this moment. What started as a light drizzle throughout the morning has become a downpour. Each week I enter this coffee shop while the stars still blanket the world, and I emerge after the sun has started to illuminate my table that acts as a writing desk for my weekly writing office hours. The sun should have emerged an hour ago, but the sky is grey and no light shines through. Folk music plays and the espresso machines whir; friendly chatter becomes the backdrop to my thoughts. 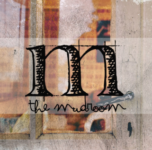 Inside all is warm and dimly lit, creating an atmosphere of serenity. Outside the storm rages. I’ve always prided myself on my strength. I come from a long line of strong women who worked hard, carried their families; women who did it all. I equated strength with quantity, with full and busy lives. So I followed suit. I launched myself into every endeavor with passion and gusto. When I travel, I seek to soak in every last moment, saying, “Who knows if I’ll ever be here again? I can sleep when it’s over.” I can do it all. I can have it all. That’s how I’ve lived for 35 years. A decade ago my body started telling me that I couldn’t keep up the pace and the emotional strain of taking on everything with all of my being. My doctor finally named my chest pains and inability to catch my breath as what it was—anxiety. Sometimes I have listened to my body, treated it well and found moments of relief; other times I pushed myself to the limit and pushed through the pain. I’ve begged God for relief. I’ve taken medication, diffused oils, stretched through downward dog and pushed my muscles to the limit in the gym. I’ve soaked in suds, played with my kids, escaped into books. But I never stopped believing I could do all the things. I pretended I was slowing down when I turned down certain commitments. But I replaced those with new ones. I couldn’t let go of the addiction of activity, the rush of busyness. I said I wanted stillness but I didn’t really. When left alone with my thoughts, I was forced to face the realities I didn’t want to. Introspection became the thing I avoided with all of my doing. Do you know how it feels to be at capacity and long for Sabbath, for rhythms to renew your soul. Confession? I do, too. 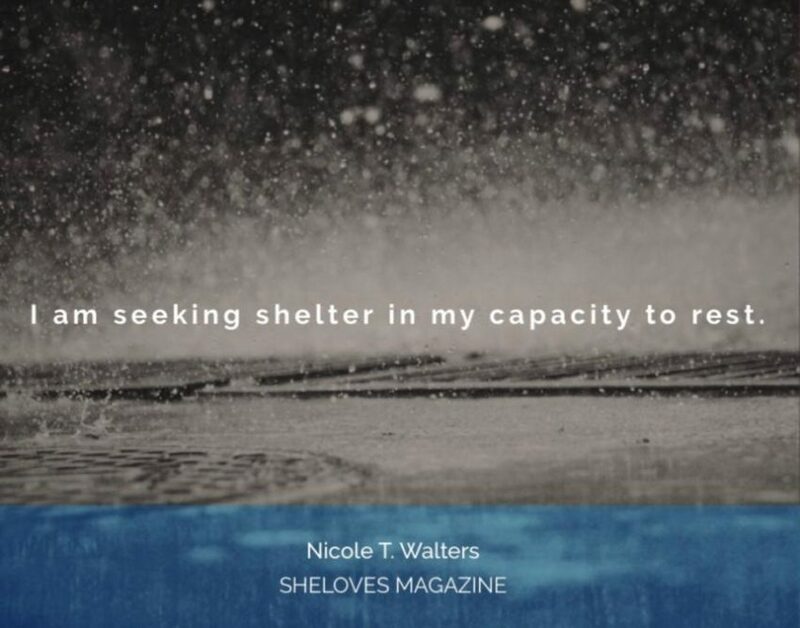 Join me at SheLoves today as we seek shelter in our capacity to rest. The Cost of Peace. For the Mudroom. The star that lights the way to the one who delivers. The angel that sings of peace on earth. The manger that holds the hope of the world inside. We love to sing and ponder the wonder of this time of year, to hold the beauty of a silent night close to our hearts. 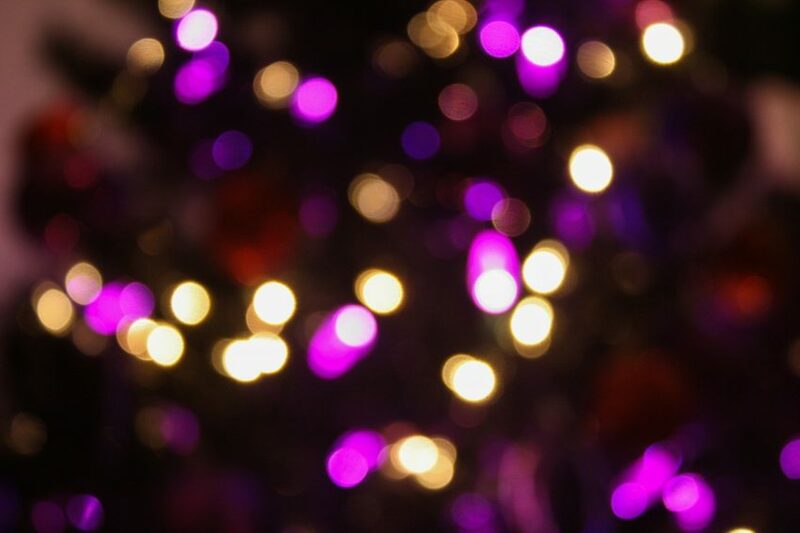 But so often our hearts are anything but at peace as the holiday draws near and the flickering lights mock us. Hope seems out of reach and a silent night is all but a story in a children’s book that we can’t imagine being our reality. What then? Does Christmas offer anything when all is not calm and bright? So much unknown darkens the heart of Christmas for me this year. The gloom of declining health of family members casts a shadow over celebration. The grief of a life in transition and the uncertainty of what lies ahead in the coming months hangs over all our festivities. The never-ending parade of duties overshadows the sacred Advent call to waiting and expecting. And that’s just my tiny little world. I can’t even begin to name the darkness that threatens to overtake so many people this season — the fear of what is to come in our divided nation, the death raining down on a city under siege across the world tonight, the bombs claiming more and more lives each day. As darkness threatens to close in, I sit in the quiet where tiny dots of light are piercing the night. It’s here in the dancing shadows cast down by the sparkling evergreen reminder of hope that I realize this: peace comes with a cost. My mind struggles to place this feeling—this breathlessness, the sensation of reaching for something secure. I lie in bed trying to quiet my thoughts, forcing my chest to rise and fall in regular, timed breaths. I think over all there is to do and all I have left undone today. I fret over all the plans that feel over my head. I imagine water rising around me. A memory plays at the edges of my consciousness and I suddenly know when I felt this way, just a few weeks before. My brave little girl had made the move from tentative wave jumper to full-blown ocean lover this summer. We vacation yearly at the same beloved beach and we loved being back, days spent covered in salt and sand. She would beg me to take her, boogie-board in tow, far out to where the waves were breaking. Their white peaks would tease us, our hearts racing as they neared. Most often they would dissipate before getting to us. But once in a while, the foamy rushing water would tower over our heads and carry us in, sometimes under. The water was up to her shoulders but not too high for me. 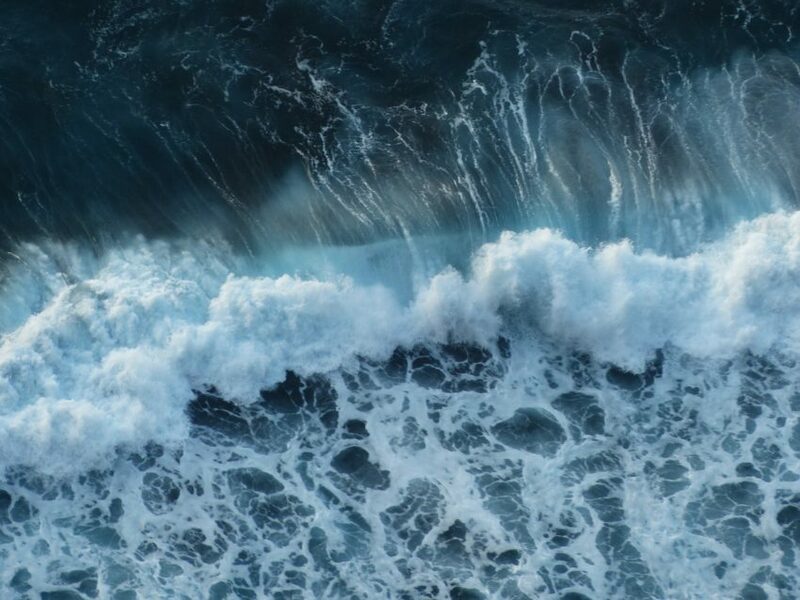 I wanted to see the great waves the way she saw them, so when she was occupied with friends I broke away to venture farther out into the chilly, murky Atlantic. I swam until my feet dangled and my head bobbed up and down with each move of the water. I couldn’t see another person near. There was only water and sky in every direction. Completely at the mercy of the sea, completely caught up in it. For a moment I marveled at the beauty of it. There is nothing I love more than the tranquil sound of waves lapping against the shore, the vastness of it all. I felt my smallness so keenly in that moment, knew my place in the world. A tiny spec in the seemingly endless ocean—I marveled at the Creator of all this. How could He care for this one tiny life in the world where so much mattered more? This is what I wanted, to know my place and feel the weight of His care for me despite my smallness. But then, feeling the utter lack of control I had as the undertow began to tug at me, I felt the panic rising up in my chest. As much as I love the ocean, I fear it equally. I’ve never been a strong swimmer. Not another soul in sight and the shore growing farther away, I fought my breath coming in gasps. The same sea that evokes such peaceful imagery can become a beast without warning. That vastness could so easily swallow me whole. I closed my eyes and swarm hard until my feet could find the soft sand squishing between my toes, the comforting feeling of control returning. Sometimes it is the burdens I bring home from the workday that I unload on my husband. Other times it is the frustrations with the kids or just with daily life. Over the years I have poured out my heart to this man who willingly listens with a nod and a knowing smile. It’s not always pretty. He rarely offers advice unless I ask and he doesn’t rush in to fix it. He just listens, offers the gift of his presence. Ever the worrier, I find my balance in him with his effortless trust that everything will be okay in the end. He helps this controller loosen her grip, the fixer in me let others be who they are. I am the opposite from him in almost every way. God knows I needed a man like this, even though sometimes I would love him to just be able to fix all of my mess. A few months ago we celebrated ten years of building this life together and dreamed of some time away, just the two of us. We have been in a particularly stressful season of life lately and the tension building in both of our shoulders showed it. We sat crunching numbers together as my tears fell down. That cruise we had been looking at booking for our anniversary felt like it was slipping through my fingertips as unexpected expenses piled up. 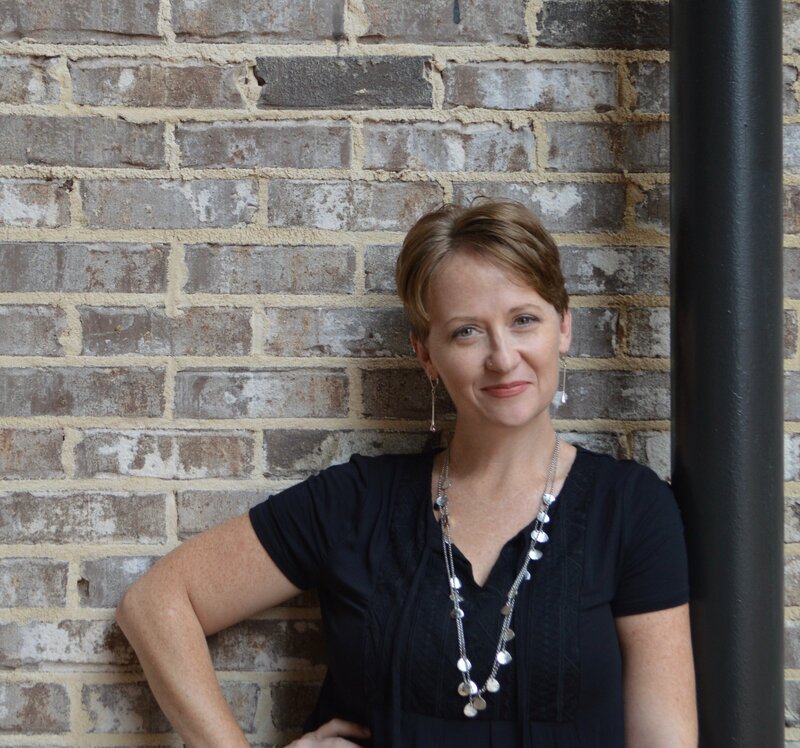 My breathing slowed and I wanted to say “no.” I wanted to tell him about how the numbers didn’t add up and why I held onto my worry like a safety net. Instead, I nodded and he squeezed me tight. I held onto him as he prayed over our kids, our finances, this trip, and our marriage. As we sat on the deck of that cruise ship under the Caribbean sun, I looked up from my novel, the first I had the chance to read in months. He was engrossed in a book of his own. This day wasn’t some magic solution but it was something we both needed desperately and he knew it. We didn’t talk much that morning on the ship, just held space together. 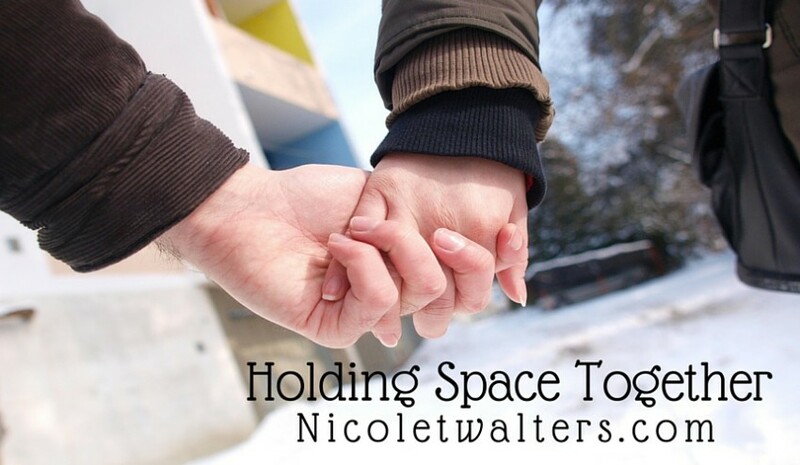 We’ve been holding space together for ten years now. Sometimes there are words and other times we can just be silent. That’s the beauty of partnership. I realize how grateful I was for this man who could be with my in the big, joyful moments and sit with me through the struggling ones, too.